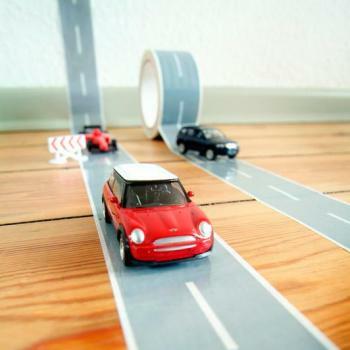 This amazing Tape and Race Car Kit lets your kids set up a track wherever they are. All you will need is a floor to stick it on, peel of the tape and the kids will be off to the races. The tape will stick to any hard surface – floors, walls, tables, appliances – and comes off quickly and cleanly once the race is over. The tape, which measures 33m long and 5cm wide. The Tape and Race Car Kit also comes with an assorted penny racer and pull back car to get your little one started.